Robbie Madison flies through an aircraft graveyard in this video. Robbie Maddison succeeded in jumping the fountains at Caesar’s Palace in Vegas, where Evel Knievel famously failed. In fact, he did it twice in the same night. He’s jumped San Diego Bay and the Corinth Canal. He served as Daniel Craig’s stunt double in the rooftop riding scenes in the latest Bond film. And now, he’s put together the video below. 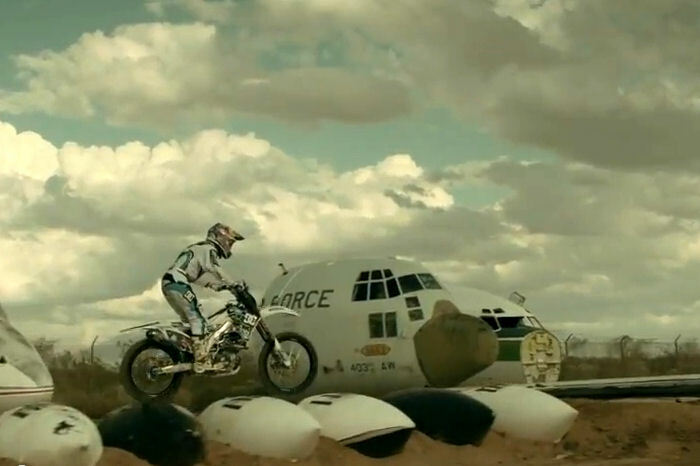 If you’ve ever wanted to watch a stunt rider rip and tear through an aircraft boneyard, here’s your chance. It’s worth watching to the end, as the clip shows a few of Maddison’s wipeouts in filming as well, proving no rider is perfect – but some are a lot better than others. where is this aircraft graveyard?